That’s right, Super Movie Monday is back to herald the beginning of a site-wide “Origins” retrospective. For the next who-knows-how-many weeks (a number which could well be “one,” depending on how much material I develop), we’ll be examining some of the seminal and mostly unknown works which helped form the modern superhero genre. 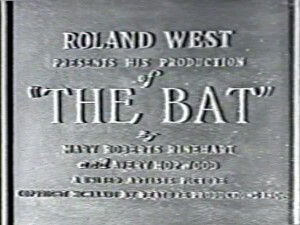 Our first movie is the silent thriller, The Bat, from 1926. 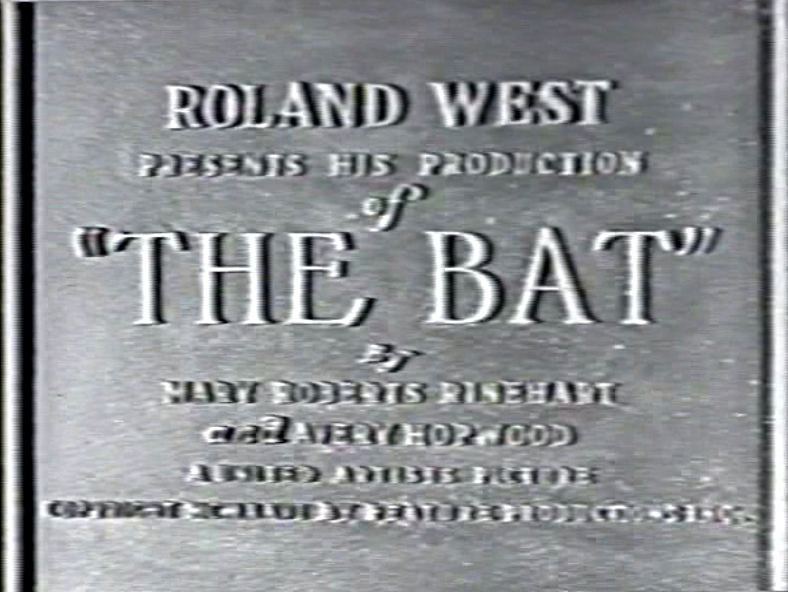 Directed by Roland West, The Bat is an adaptation of the successful stage play of the same name by Avery Hopwood and Mary Roberts Rinehart, which was itself heavily adapted from Rinehart’s successful mystery novel, The Circular Staircase. 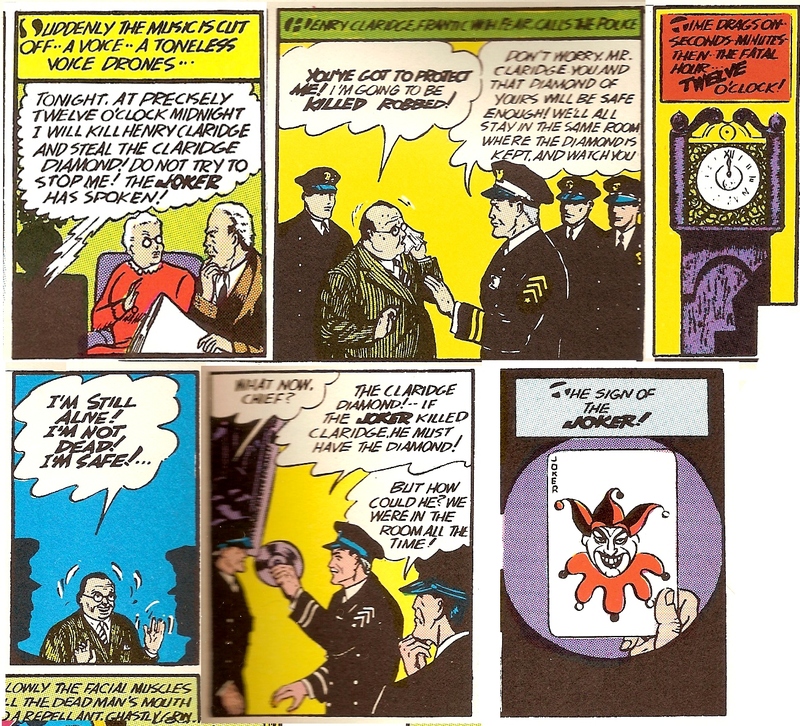 What makes The Bat significant for our purposes is that its talkie remake a few years later, The Bat Whispers, was named by Bob Kane as one of the primary influences for Batman. However, it would appear that the silent version was the real primary influence, for reasons I’ll explain when we get to them. One other surprise in the credits: settings by William Cameron Menzies. Menzies was a legendary art director and production designer whose credits include the Douglas Fairbanks silent classic The Thief of Baghdad, the 30’s adaptation of H.G. Wells’ Things to Come, Gone With the Wind, and the 50’s sci-fi classic Invaders from Mars (which he also directed). The movie opens with this screen, in which we learn that the NO SPOILERS! crowd has been around as long as movies themselves. So there’s this master criminal, see, who calls himself the Bat. And in the first scene, we meet his next victim, rich old Gideon Bell, owner of the famous Favre Emeralds! He is sent a warning note that “The Bat” will steal his emeralds at midnight. So he holes himself up in his fancy apartment with his giant collar and practically the entire police department down on the street or in the next room, ready to put a stop to any attempted crimes. Oh yeah. 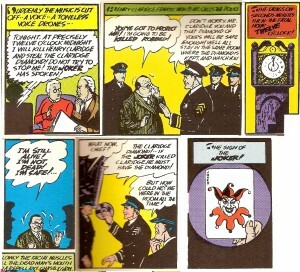 The panels above are from the first appearance of the Joker in 1940. The actual story isn’t this disjointed, but I’ve pulled out individual panels that repeat the high points of this scene which parallel the opening scene of The Bat! At midnight, Bell breathes a sigh of relief and pulls the emeralds out of the safe to celebrate the fact that he still owns them. The note was apparently some sort of bluff. ThenBell leans out the window to fix a flapping window shade, while still holding the emeralds in his hand, and the Bat, dressed in a long flapping coat and a pointy-eared mask, kills Bell and takes the emeralds while hanging from a rope outside the window. He leaves another bat-shaped taunting note for the police as he is leaving. Later, the Bat is on the roof of the Oakdale Bank about to break in a skylight. We can see several elements of the Batman to be in this scene. Notice the mask with the long ears and the long coat that almost seems like a cape. That thing in his hand is a pouch containing his burglar tools, including a rope and grappling hook. Meanwhile, let’s go to a mansion built by Courtleigh Fleming, president of the bank that just got robbed. The mansion has been rented by wealthy society lady, Cornelia Van Gorder (in the book and play, she is identified as a writer of mysteries, but in the film, she’s just a smart old lady who rarely looks up from her knitting). Her maid, Lizzie, is in a fright over newspaper accounts of the Bat (who has told the police in his latest taunting note that he is headed to the country to relax), so she’s setting bear traps to catch him. Which comes in handy, because both the Shadow and the Bat have shown up at the isolated mansion for some mysterious purpose. And could that mysterious purpose have something to do with the $200,000 that has been robbed from the Oakdale Bank at the exact same time that bank president Courtleigh Fleming has been declared dead while on vacation in Colorado? Hmmm, could be. Hmmm… That sounds familiar, too. 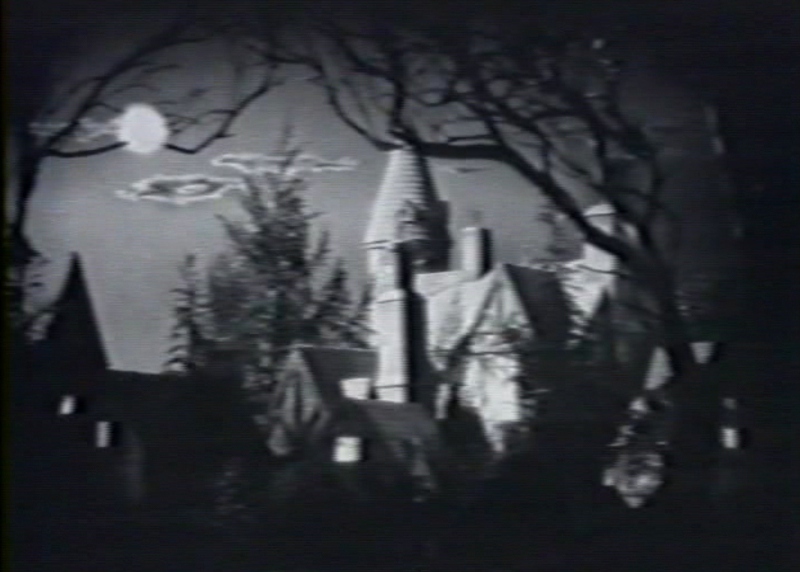 Of course… Several parts of the plot also remind you that the original Scooby Doo template borrowed more than a little from this genre of Old Dark House mysteries. But what niece was Wells talking about? The niece who seems to have a secret agenda of her own. She sneaks a mysterious young man into the house and gives him some shabby clothes to disguise himself so he can pose as the new gardener, named Brooks. Ms. Van Gorder sees through the ruse right away, but doesn’t say anything, because at least he’s less creepy than the Japanese butler. Suddenly, a note tied to a rock crashes through the window, warning them to leave the house. Doctor Wells arrives moments later, acting very suspiciously. But not as suspiciously as niece Dale and her not-a-gardener boyfriend, who are searching for a rumored hidden room in the house. And Detective Moletti, tasked by the police chief to find the Bat, has also mysteriously appeared at the house, though no one’s sure why. 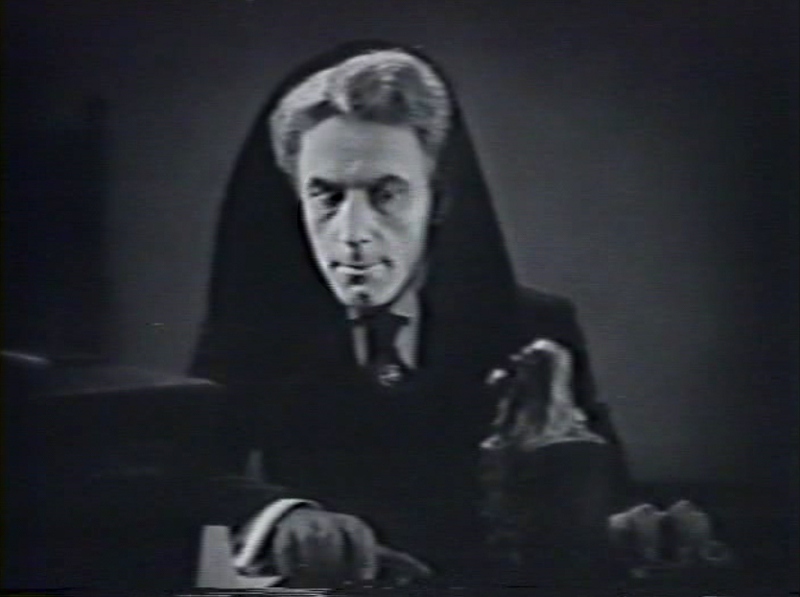 Lizzie is terrified by the appearance of The Shadow, who wears a watch with a glowing radium dial, which scares her as it dances through the darkness. 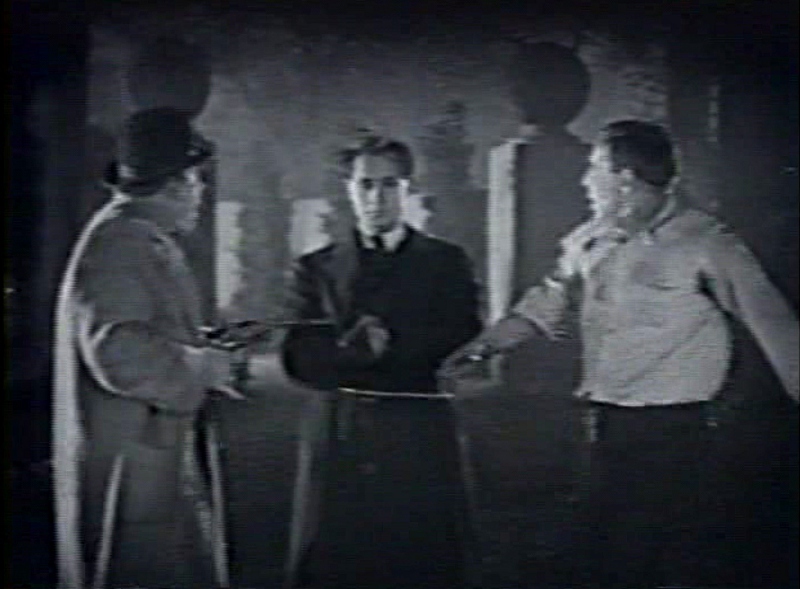 Detective Moletti chases after The Shadow, and runs into Gardener Brooks, searching for the hidden room. There’s a ridiculous chase; this really is Scooby Doo. All you need is a bubblegum pop song to accompany the chase. Niece Dale tells Richard Fleming that she believes the missing securities might be in the hidden room. Richard Fleming then finds the blueprints to the house so that he can find the secret room, but as he and Dale argue over the fragment he has torn from the blueprints, a door opens and they are caught in a beam of light, which leads to this really cool moment. West superimposes the dialogue over the beam of light to signal that the voice seems to be coming from the light. Really inventive and cool. 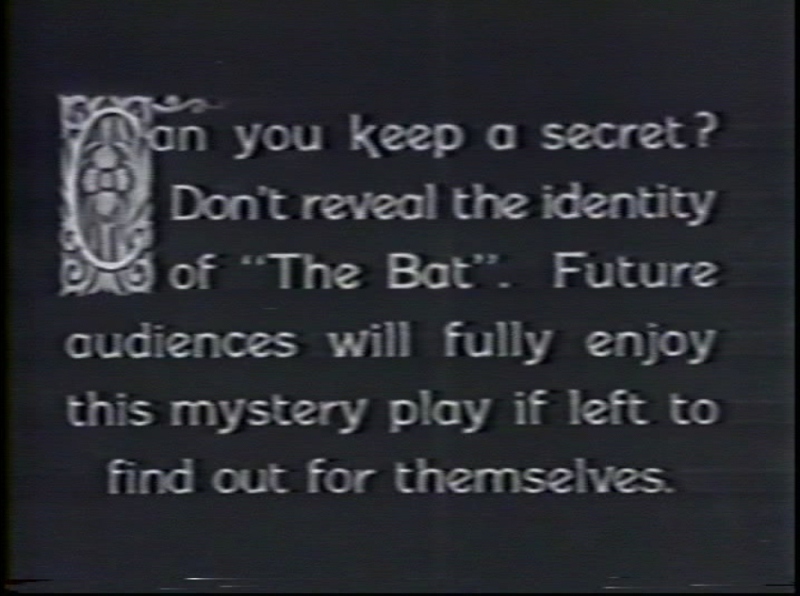 Not to go into too much details, but the rest of the film is a series of mysterious happenings–mysterious phone calls from the garage, the arrival of a new detective (a private detective Ms. Van Gorder sent for the previous night), and a mysterious bat-signal that sweeps across the walls. The signal turns out to be a false alarm, though. Just a moth on the headlight of Doctor Wells’s car as he arrives to pronounce Richard Fleming dead. But this appears to be yet another piece of inspiration for the future Batman. 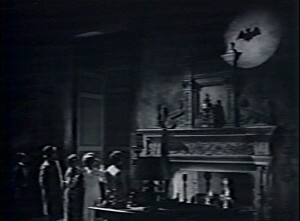 Problem is, Bob Kane credited the sound remake, The Bat Whispers, as having been the inspiration for Batman, while two of the biggest influences–the pointy-eared mask and the false bat-signal–apparently appear only in the silent version. This leads Dial B for Blog to assert that there is no connection between the two, but I’m not so sure. I wonder if perhaps Bill Finger had seen and been inspired by the silent film as a child. There seem to be too many coincidences otherwise. 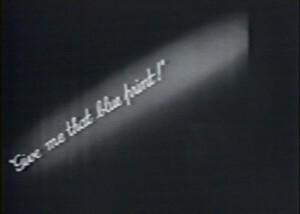 Doctor Wells finds the scrap of blueprint clutched in Fleming’s hand, since no one else has even looked! And it turns out, Wells is in league with The Shadow! Detective Moletti confiscates the blueprint scrap from Wells and searches for the secret room, but to no avail. While the private detective and the maid are indulging in some Shaggy-and-Scooby-style hijinx up in the haunted ballroom, Dr. Wells creeps up on Detective Moletti (turning out the lights as he goes to stay under cover of darkness), then beats him senseless with the phone. And phones in those days were heavy! Wells ties Moletti up and carries him off. And as if things weren’t complicated enough, suddenly another man turns up–beaten and bloodied and apparently suffering amnesia, although he seems alert enough when everybody’s back is turned. 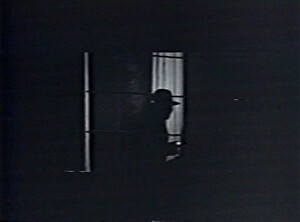 While most of the gang attempts to identify him, The Shadow locks them all in the parlor. Meanwhile, the Bat has found the hidden room and attempts to break into the safe. The heroes break out of the parlor and Brooks heads outside to look around. He spots The Shadow lurking on the roof without his bandanna… and it’s Courtland Fleming, supposedly-dead bank president! He informs the others of this amazing development. They try to follow, but Dale gets separated from the group and discovers the hidden room! Where she runs into the Bat and the Shadow! Damn! There’s a creepy close-up of the Bat. The Shadow is killed and the Bat flees, with timely help from Doctor Wells. Minutes later, Detective Moletti appears, seething with anger at the Doctor. He has managed to free himself from his own handcuffs and exposes the Doctor for the fraud he is. Finally the elements of the mystery are unwound. 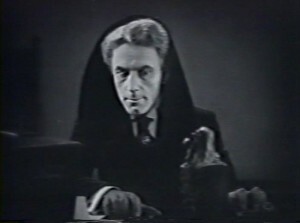 The Shadow was Courtleigh Fleming, who robbed his own bank with the assistance of Doctor Wells, who forged the death certificate. They planned to abscond with the money and leave Gardener Brooks (actually bank cashier Brooks Bailey) to face the rap. 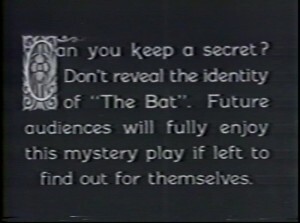 Meanwhile, the Bat comes to retrieve the money, but the amnesiac suddenly takes control of the group and the Bat is caught. 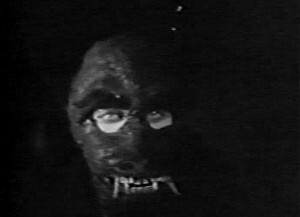 However, he has prepared an escape plan, turning out the lights with a secret gimmick and fleeing into the darkness. But as he’s making his escape, he gets caught in the beartrap that Lizze set way back in the beginning, and finally the Bat is unmasked! Ahem. Finally the case is solved. 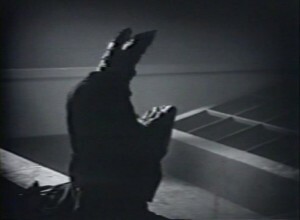 But really, when you look at all the elements of the Bat–a man who dresses as a bat to frighten his enemies, a man who creeps over rooftops and swings from a rope and is a master of both planning ahead and thinking on his feet, as well as the batsignal image and the similarities between the Bat’s murders and the Joker’s m.o.–it’s hard not to think that there had to be some influence there, either on Bob Kane or Bill Finger. No idea what I’m going to cover next, except that it’ll be old. See you soon. 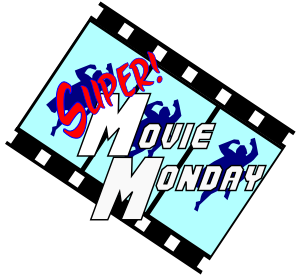 This entry was posted in Super Movie Monday and tagged Batman, Movies, Origins, Silent Film. Bookmark the permalink.